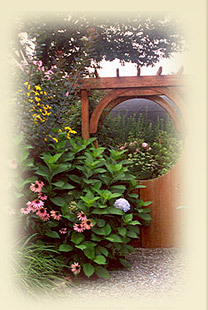 The Gilded Lily offers year-round, detailed grounds keeping programs that include creative and colorful plantings, pruning of trees and shrubs, watering, weeding, mulching, lawn and landscape fertilizations, lawn mowing, and Fall clean up. 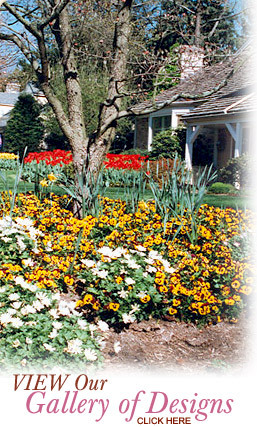 Our exceptional designs use a combination of annuals, perennials, shrubs and trees, which make your entire landscape come to life with vivid colors and sweet fragrance. Unique floral containers filled with blooming flowers will add a splash of color and life to your entrance, terrace, deck, pool and courtyard. Window boxes, unique topiaries and defined borders add the perfect touch. The Gilded Lily is an environmentally conscious company, using organic fertilizers, fungicides and beneficial insects to control pests.